Welcome to the official, trustee sanctioned, Pike Township, OH website. To make navigation easy, a multi-level menu has been incorporated above. You can get to any page on this site with only one click. This site is not yet complete. Please check back often to check for changes and updates. FIRE/EMS PERSONNEL NEEDED - Pike Township Fire/EMS is recruiting volunteer Firefighters and EMTs and part time EMTs. All levels of certification are needed. Training is provided. If you are interested in supporting your community by volunteering or participating in the partime EMS program, contact the firehouse at 937-964-8958 or stop by the firehouse at 8440 Troy Road. Click Here to download a Word format application. Click Here to download a PDF format application. You can drop off a completed application at the firehouse or email it to piketwpemployment@gmail.com. PIKE TOWNSHIP MILITARY BANNER PROGRAM - The North Hampton Lions Club is excited to bring to the local community a program to honor friends and family who have served our country. Click Here to download a PDF format application with more information and instructions. ARE YOU OK? - The Clark County Sheriff's Office has started a new program that enables them to check on serior citizens over the age of 65 or those disabled on a daily basis to make sure they are OK. Those who sign up will receive a phone call each day. Once the citizen answers and presses the appropriate button on their phone, the system will recognize that they are OK. If the citizen does not press the correct button, a deputy or law enforcement officer will be dispatched to check on the citizen. Click Here to see more information on this program. You can call Mike Combs, the 911 Coordinator, at 937-521-2073 with questions. DO YOU HAVE A SECURITY CAMERA? - The Clark County Prosecutor's Office has started a new program that will enable residents and businesses help solve crimes. More and more security cameras are in use across the county and they can be an important tool in helping law enforcement. This new program allows residents and business to register their security cameras with the Prosecutor's Office. If you register, the office will contact you to obtain information about your system. Then, if a crime occurs in your neighborhood, the Prosecuter's Office may contact you to see if your system may be of assistance to them in helping solve the crime. Your system will not be monitored by anyone but yourself. If your assistance is needed, you will be contacted. Click Here to download the registration form. You can call the Prosecutor's Office at 937-521-1770 with questions. FIRE DEPARTMENT TRAINING - The Pike Township Fire Department periodically trains with our rescue tools that are used to extricate victims of auto accidents. Effective training includes actually using the rescue tools to disassemble old vehicles. If you have a vehicle that you can donate to the department for training please call the fire department at 937-964-8958 and leave a messge. One of the fire officers will contact you. Please note that you must sign over the title as the car will be destroyed and will not be returned to you. This training is invaluable in helping us keep prepared for saving lives. PIKE TOWNSHIP MEETING MINUTES are available online. Click on Meeting Minutes under PIKE TOWNSHIP in the main menu. The Pike Township/North Hampton BUSINESSES, CHURCHES and ORGANIZATIONS web page is active. If you have any changes or corrections, email your information to the webmaster. Click Here to initiate the email and send us your information. Pike Township Trustees meet the 1st Tuesday of each month at 7:30 PM except in Jan, Feb, Mar and Dec when the meetings begin at 6:30 PM. There is also a meeting on the 3rd Tuesday of each month at 8:30 AM. The meetings are held at the township building at 83 N. Church St. in North Hampton. North Hampton Village Council meets the 2nd Tuesday of each month at 7:30 PM at the village offices located at 250 W. Clark St. in North Hampton. The Pike Township Crime Watch meets at 6:30 PM on the 3rd Monday of each month at the Pike Township Firehouse at 8440 Troy Road. Contact Cindy Gotee 964-8868 or Gayla Kelsey 964-8981. NOTICE: The WARN system that was implemented by Clark County has been replaced with a new mass notification system HyperReach. This system can be used to rapidly notify citizens of local emergencies or community events like weather notifications. You can even register your cell phone numbers with this system. CLICK HERE to sign up for the potentially life saving, free service. 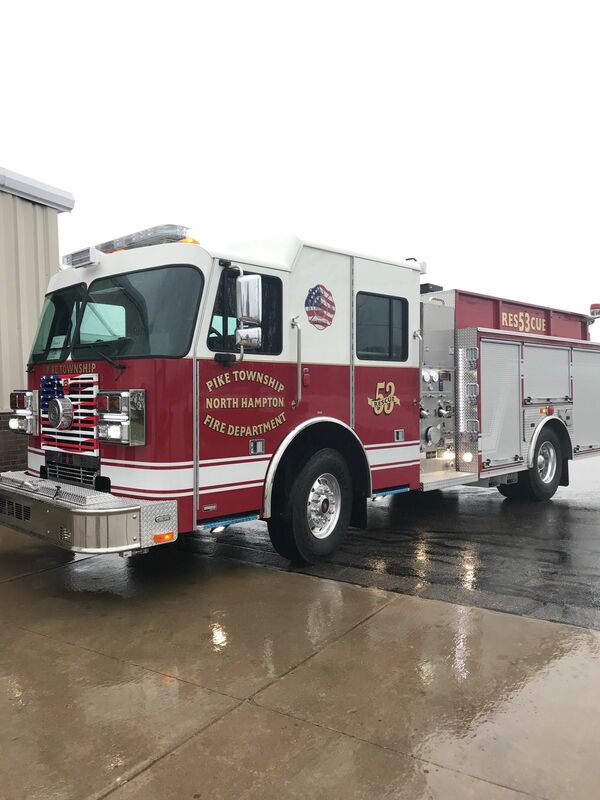 Below is a photo of the new 2018 Rescue Engine that was purchased with the generosity of the taxpayers. This vehicle will help the department get more equipment to the scene of an emergency quicker with fewer personnel. The truck is now in operation serving the community.